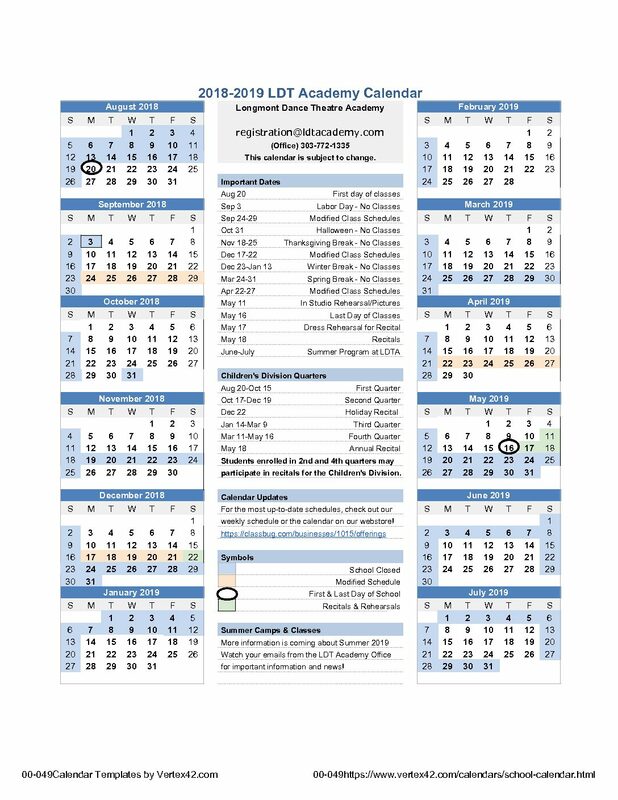 Click on the school calendar for options to print. For the most up-to-date schedules, please see our current class schedules or the calendar on our web store! Classes start August 20th. Email registration@ldtacademy.com for registration questions or Contact Us through our Website. Our classes are based on a 32-week Fall and Spring season. Classes run August 20, 2018 – May 16, 2019. Our school calendar is subject to change. If you are registered for a class, you will receive updates by email when there are changes to class schedules. School closures occur for Labor Day, Halloween, Thanksgiving Break, Winter Break, and Spring Break. Modified schedules due to Centennial State Ballet Performance weeks are announced in the studio since many of our students participate in these performances. Students in the Children’s Division have two recitals – the Holiday Recital on December 22 and the Annual Recital on May 18. Participation in recitals is optional but encouraged. Costume fees and recital participation fees are not included in tuition. Students in the Elementary Division have one recital – the Elementary Division Annual Recital on May 18. This recital is for students in Kindergarten through Third grade and include students enrolled in Ballet, Boys, and Tap/Jazz. Costume fees and recital participation fees are not included in tuition. Students in the Intermediate Division and Teen Division have one recital – the Upper Divisions Annual Recital on May 18. This recital is for students age 8-18 enrolled in Ballet, Boys, Jazz, and Modern classes. Costume fees and recital participation fees are not included in tuition. Recital Participation Fees and Costume deposits may be included in your Program Registration in order to spread out the cost over the year. Watch for the Recital Survival Guide which will be emailed to the address on the Head of Household account.